New Issue of Critique "Fascism Now and Here" is out. 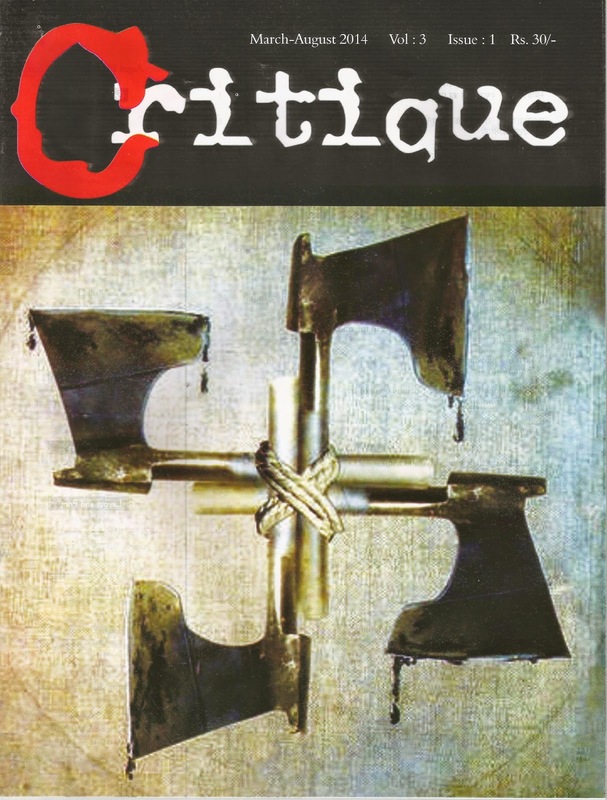 Critique Magazine, August, 2014, Volume: 3 Issue: 1. Pg. 56. Rs. 30 /-. To order your copies write to delhi.nsi@gmail.com Sharing below the cover of this issue and the content list. Editorial Collective: Aashima Subberwal, Amrapali Basumatary, Bonojit Hussain, Devika Narayan, Kavya Murthy, Lokesh, Malay Firoz, Mayur Chetia, Misha Maitreyi, Naveen Chander, Pravin Kumar, Praveen Verma, Sanjay Kumar, Subhash Gatade, Sudha Vasan, Vasundhara Jairath, Urmi Ninad. Front Cover: Painting by John Heartfield "The Old Motto of New Empire: Blood and Iron". Back Cover: Sketch by Bhagwati Prasad "The Wave".